According to Reading is Fundamental (RIF), Nearly two-thirds of low-income families in the U.S. own no books. That is just plain wrong. But, we can help fix it. I recently started a literacy initiative encouraging people to donate new or gently used books to needy kids, locally-wherever you are. It has caught on in the US, and we also have people passing it on in the UK and Australia. Many children’s book authors are participating by giving local kids in need copies of the books they’ve written. Never, ever, underestimate the power of a picture book. I believe that every child’s Bill of Rights should be indelibly inked with the right to have picture books read to him/her. And, they deserve to have books of their own. Many of us take for granted the sacred ritual of cracking open a picture book, and cuddling together while the words and pictures collectively take us away. You can probably recall having been read to by your parents or caregivers. You likely hold a special picture book, from your childhood, close to your heart. And, until now, you’ve probably not given much thought to how profound that experience can be. When I look back on my early childhood memories, I recall a lot-good and bad. But, there is not a single memory of anyone reading to or with me. I cannot name a favorite picture book from my childhood; I don’t have one. We were poor, and picture books were not a top priority for my teenaged parents. Later, picture books were not on my single-mom’s priority list either. I guess that’s why picture books hold such a special place in my heart now. Perhaps that’s why, like a starved hyena, I gobble them up. Maybe it’s why I chose to write my own. I know it is why I jump up on my soapbox, touting the power of picture books. 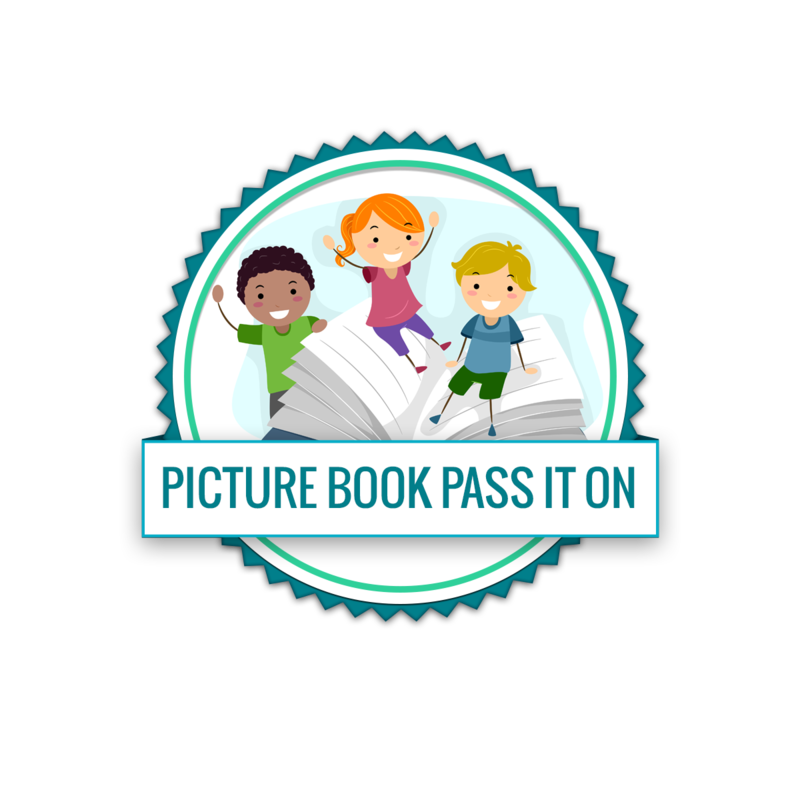 I am celebrating the power of the picture book by starting an initiative called, Picture Book Pass it On (#PBPiO) to give kids in need their very own books. #1 Pledge to donate a new or gently used picture book/s to a children’s charity in your area. Oh, and be sure to share your giving story on our Facebook page https://www.facebook.com/PBPiO . We love to see how books are reaching kids all over the globe. Michelle, is there a group in Canada? I would like to support this and pass it along, but not without some direction of where they can donate. Thanks, you have a wonderful blog! 1. I blogged about the initiative and shared my story of growing up in a home without picture books. I included a picture of my son and me holding one of his favorite picture books, How Do Dinosaurs Say Goodnight. I also shared the blog post on Twitter, Facebook, Linkedin, and other social networking sites. 2. We pledged to donate picture books to a local inner-city school. From there, Andy blogged about PBPiO and challenged other bloggers to participate. She passed in on to blogger Sylvanian Ramblings (in the UK) who then passed it on to other bloggers. Before I knew it we had people participating in Australia (see below). I would be delighted if you spread the word in Canada! Please let me know if I can provide any additional information. I wish you a very beautiful holiday season! I am going to make this a New Year’s project. Ii worked in the public school system for 20 years with primary aged children. I know the need and appreciate all the wonderful picture books out there. Thanks Michelle so much for your caring and initiative. That’s fantastic! I hope you’ll keep me posted! What a wonderful thing to do! I’m so glad it’s catching on. We have a similar group put together by Retired Teachers in my County. I donate to them regularly. Hi Wanda. Thanks for stopping by and for the re-blog. Your book program sounds like a winner! I wish you the best! Thank you, Michelle. Thank you also for taking the time to check out my blog and comment. Have a great day!